Lockheed Martin delivered the 52nd C-5M Super Galaxy strategic transport modernized under the U.S. Air Force’s Reliability Enhancement and Re-engining Program (RERP) on August 2 at the company’s Marietta, Georgia, facility. «With the capability inherent in the C-5M, the Super Galaxy is more efficient and more reliable, and better able to do its job of truly global strategic airlift», said Patricia Pagan, Lockheed Martin Air Mobility and Maritime Missions Strategic Airlift director, «I am very proud of the contractor-government team than carried out the C-5 fleet modernization effort. We’ve worked very hard to ensure the C-5Ms are the absolute best strategic airlifters possible for our armed forces». An Air Force Reserve Command aircrew from the 439th Airlift Wing at Westover Air Reserve Base, Massachusetts, ferried the final C-5M Super Galaxy to Stewart Air Force Base, New York, where the aircraft will undergo interior paint restoration. Once that work is complete, the aircraft will be flown to Westover where it will be the eighth C-5M Super Galaxy assigned to the base. The heart of the system is the GE F138 turbofan engine (known as a CF6-80C2L1F in the commercial world) de-rated to 50,000 pounds/22,680 kg of thrust on the C-5M Super Galaxy. This engine provides 22 percent more thrust than the out-of-production TF39 turbofans on the earlier C-5A/B/C aircraft. The engines also allow the C-5M Super Galaxy to meet the FAA’s (Federal Aviation Administration) Stage 4 noise reduction requirements. These changes, taken together, result in a 22 percent increase in thrust, a shorter takeoff roll; a 58 percent improvement in climb rate; allows the C-5M Super Galaxy to cruise – at maximum gross weight – in the Communication/Navigation/Surveillance/Air Traffic Management (CNS/ATM) flight environment; and greatly enhanced fuel efficiency and less tanker support demand. First flight of a modified aircraft to the C-5M Super Galaxy standard came in Marietta, Georgia, on June 19, 2006. The first operational C-5M Super Galaxy was delivered to Dover Air Force Base, Delaware, on February 9, 2009. A total of 49 C 5Bs, two C-5C aircraft, and one original C-5A was modified under RERP. The C-5M Super Galaxy holds 89 FAI-certified (Fédération Aéronautique Internationale) world aviation records, the most by any aircraft type. These records include time-to-climb with payload, altitude with payload, and greatest payload carried. The C-5 Galaxy has been operated solely by the U.S. Air Force since 1970 and is the largest strategic airlifter in the U.S. Air Force’s fleet. The C-5 Galaxy is capable of carrying two 78-ton M1A1 main battle tanks or helicopters and other large equipment intercontinental distances. Fully loaded, a C-5 Galaxy has a gross weight of more than 800,000 pounds/362,874 kg. All of the C-5s were built at Lockheed Martin’s Marietta site. The C-5M Super Galaxy aircraft is a game changer to the warfighter and America’s premier global direct delivery weapons system. It is also the Air Force’s only true strategic airlifter. 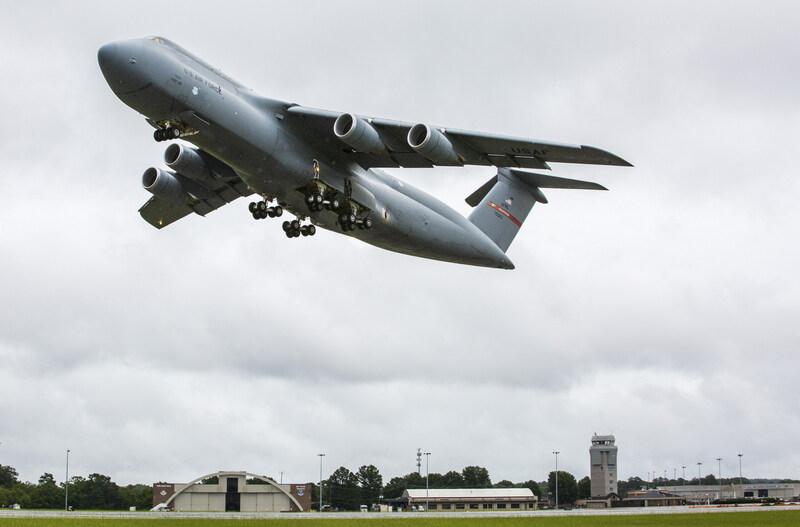 While setting 86 world records in airlift, the C-5M Super Galaxy established new benchmarks in carrying more cargo faster and farther than any other airlifter. A venerable workhorse, the recognized improvements in performance, efficiency and safety it provides validate the tremendous value to the taxpayer in modernizing proven and viable aircraft. 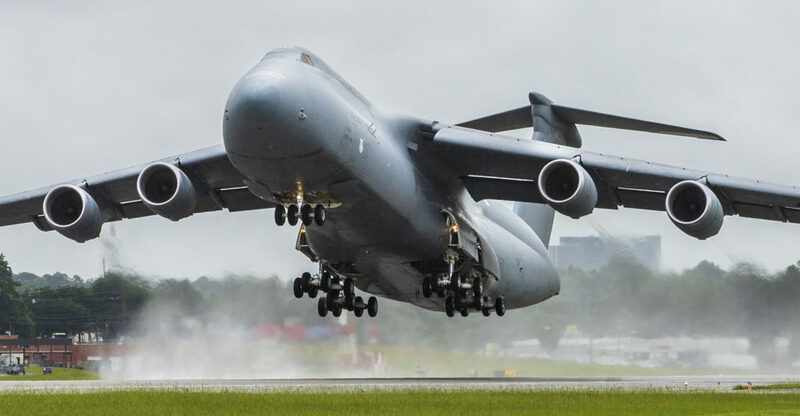 As the only strategic airlifter with the capability of carrying 100 percent of certified air-transportable cargo, the C-5M Super Galaxy can carry twice the cargo of other strategic airlift systems. The C-5M Super Galaxy also has a dedicated passenger compartment, carrying troops and their supplies straight to the theater. It can be loaded from the front and back simultaneously, and vehicles can also be driven directly on or off the Galaxy. This means the C-5M Super Galaxy can be loaded quickly and efficiently. The C-5M Super Galaxy has been a vital element of strategic airlift in every major contingency and humanitarian relief effort since it entered service. The C-5M Super Galaxy is the only strategic airlifter capable of linking America directly to the warfighter in all theatres of combat with mission capable rates excess of 80 percent. With more than half of its useful structural life remaining, the C-5M Super Galaxy will be a force multiplier through 2040 and beyond.